Ever wonder how to get huge, lush-sounding backing vocals? I used to think the secret was simply being a stellar vocal talent, but fortunately, that’s not the case. The real secret is mainly just stacking a lot of tracks for a smooth, “homogeneous” sound. And as you’ll see, you don’t need to be a great singer. When a section of a song is set to loop, Mixcraft automatically records a new pass with every “go-round” of the looped section – each pass is a separate audio recording and is assigned to a new automatically created “lane” on the record track. The most common use for take recording is to lay down multiple passes of a vocal or instrumental passage for later editing into a single optimized performance, but there’s no reason we can’t use take recording to build multiple vocal tracks, with the intention of using all of them (or at least most of them, depending on the quality of the performance). Now that we’ve looped a section, here’s a video showing the recording of my three-part harmony (with four layers of each line). The idea was to end up with an acapella vocal, but I tracked an electric piano part for pitch reference. I edited some of the tracking out, because watching me sing the same lines over and over is little lengthy, but I actually did record four layers of all three harmony parts in one giant “take” (in other words, Mixcraft cycled around 12 times). There’s a couple things I want to point out about the video. First of all, you certainly don’t need to record all the vocals in one take – you could separately record the four layers of each harmony. But keep in mind that besides saving time, take recording lets you lay down unlimited takes and sort through the good and bad ones later. And while we’re on the topic of good vs. bad… you probably noticed that my raw vocal performances don’t exactly give Christina Aguilera a run for her money, and that’s part of the point. Stacking vocal performances can yield really impressive results even if you’re not a great singer (though admittedly I was coming off four solid nights of gigging here ). I find that being as consistent as possible with pitch, tone, and phrasing (i.e. making words the exact same length) is more important than beautiful tone quality. And unlike being born with a lovely set of pipes, tight vocal doubling is a relatively easily learned skill. Another thing you might notice is that you can’t hear all the parts stacking up as I’m going. This is intentional on my part because hearing all the other parts distracts me a little from what I’m currently singing, so I have monitoring of previous takes off (hit the mute button on the record track). I’m sure some people would rather hear everything; if you prefer this, turn up the fader on the record channel. In the video below, I explain how to move the takes to individual tracks, pan them for stereo, compress and EQ them as a group using a SubMix Track, and add a final reverb (as a disclaimer, at 6:18, I should’ve set the direct/effect mix knob in the reverb fully clockwise to “all effect”. Send effects should always be set fully wet, because you’re already getting the dry signal in the main mix). If your pitch is a little wonky, I recommend using multiple instances of an autotune-type plugin, set to the key of the song, for each individual vocal track (a single instance of a tuning plugin will not work properly on a SubMix track). Mixcraft’s GSnap Pitch Correction plugin is perfect for this. You’ll notice I used the TB Parametric EQ, which is included only with Mixcraft Pro Studio’s super deluxe array of plugins, but any EQ plugin could be used –even the basic channel strip EQ. As always, questions and comments are welcome… happy singing! Thanks for this Mitch– your timing is impeccable, because this weekend my wife and I are tracking background vox for a song I’m working on, and this approach seems ideal for it. I’ve used lanes extensively in MC but hadn’t done loop recording before– relied more on the punch in/out tool. Definitely going to use this technique– thanks again. Glad to help. I can’t imagine how much time I probably wasted over the years recording vocals one track at a time! Great tips for recording backgrounds. Appreciate the help! This is very informative…..I’m assuming I need the Pro version to get all the stuff you used……..This is very cool……….maybe I’ll update to the Pro model. 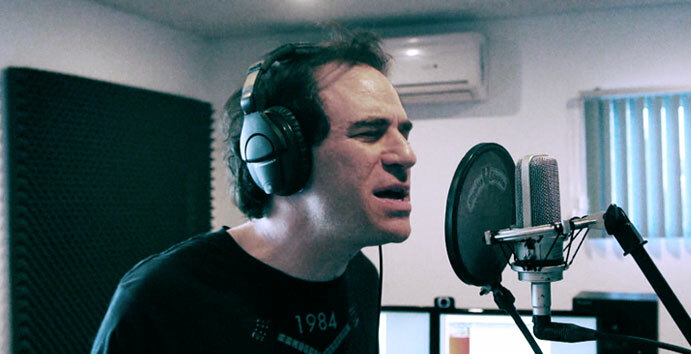 As mentioned in the video, I don’t have the greatest voice, but I’ve done a LOT of vocal recording (of myself and others)… like anything, if you keep doing it, you’ll get good at it. One built-in bonus of audio recording software is that between the waveform views and the actual audio, it’s easy to see and hear where you’re off, so I find it educational. It’s a similar thing when recording bass and rhythm guitar tracks- you get really good at it because you can see where you’re landing on the grid. Thank You for this more in-depth look at the vocal take process. I’d read somewhere that the older rock band “Queen” used to stack insane amounts of vocal tracks to get their signature sound on some songs. Thanks for showing how to do it! Do I do the same steps in mixcraft 6 (home studio) or is it gonna be different? Brilliant m8:) Got me through to using Mixcraft 6 a lot faster than anyone else..You’re a Godsend m8,Im primarily a Guitarist/Songwriter.But with few vocalists locally. I have mixcraft 6 home studio. Will I have to follow same steps or I’ll have to do something different??? Thank you sir and to everyone that contributes tutorials on Mixcraft as well. I had the trial version recently as I was doing research on DAW’s in general. I absolutely loved the software as well as the superb support Acoustica is providing. In the past week since the trial version ended, I’ve been scouring the web for comparison software and am frankly very annoyed with a lot of what I’m seeing. Lot’s of hype about how so and so’s compares with Protools and so on. But the fact is in the two weeks I had to just play around with Mixcraft I created, mixed, mastered (both wav and mp3) a dozen simple but great instrumentals easily marketable to companies for commercial jingles, or club party music as well as great background tracks for one man bands. Still saving my pennies to get the peripherals I need for vocals, but with a Boss Looper (stereo) I can still do vocals just fine, and just upload to mixcraft to do exactly what I just saw you do on the video. Thanks for showing us how to do the loop vocals and sub track as that is still a bit confusing to me. Funds will be coming in shortly and I will definitely buy Mixcraft 6. Personally I hope Acoustica takes a huge bite out of the other software DAW’s as they seem to be stooping to some very low moral standards these days to get people to burn up their credit cards to get their latest and greatest stuff. Mixcraft not only makes it easy to do the job, but shows us how to do a great job with their stuff. It’s nice to see a company that is willing to actually help their customers become successful. Please keep on making videos. You are a good teacher. I learned something new just now and don’t even have the software at the moment, but remember everything I learned while I had it so won’t have any trouble getting back to work once I buy the full version. All of you are angels of mercy for musicians like myself that had to deal with outside situations and now want to get back into the game for real. God Bless all of you and the folks that run Acoustica and make Mixcraft. Great tip Mitchell !!! I’ll be trying that on my next project… I’m all-in with Acoustica, very nice program. Big bang for the buck !!! Mixcraft Pro Studio 7 just released last week, can’t wait to upgrade !!! Is there a way to get another persons vocals to match the BPM’s in Mixcraft? I’m trying to put together a song, but I can’t seem to get the vocals to match the 120 BPM’s that I want to use. The vocals are just moving to slow and I don’t know how to match them with my track that I made…These vocals were done separately and Mixcraft was not used to make these vocals. Just trying to add them to my track to make a song. Any suggestions?? Awesome vocals. I’m also really impressed with your mastering skills. Indeed no one tries to share their knowledge if they even do,they share with very complicated way but I am very impress and delighted by your simple and very clean explanation. Thank you I will always follow up your tips and continue the same. Thank you again for your effort to share these precious information. I’ve been exploring for a littlee for any high quaality articles or blog posts on this kind of house . Exploring in Yahoo Ieventually stumbled upon this website. remember this web site and give it a glance on a continuing basis.